zeitkratzer (time scraper) is a project founded by Reinhold Friedl in 1997 devoted both to new classical and improvised music but also to noise, electro, avant-rock and traditional folklore. Among their most famous adaptations are Lou Reed’s Metal Machine Music, Karl-Heinz Stockhausen’s Aus den sieben Tagen, and Arnold Schönberg’s Pierrot Lunaire but they’ve also released some of Friedl’s own compositions. 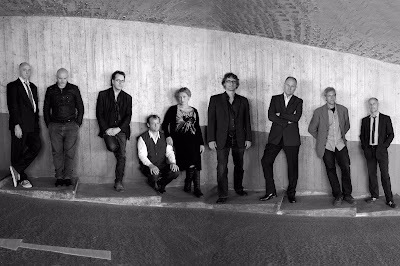 The collective has worked with musicians as different as Terre Thaemlitz, Christian Lillinger, Keiji Haino, Merbow and Jim O’Rourke. Last year I saw them live at the Météo festival performing Metal Machine Music. Due to their philosophy it was indeed sound made visible and tangible – a really unforgettable corporal experience of live music, something one had to endure in order to enjoy it. This kind of physicality of sound is achieved by the use of extended instrumental techniques and sometimes crass amplification of traditional instruments. You wanted the performance to end and continue at the same time. The result is an immense intensity of sound transcending genre borders, which brings the different musics together in zeitkratzer’s very own complex universe. This universe is mainly powered by the soloists of the ensemble, apart from Friedl (piano) there are Frank Gratkowski (clarinets, saxes), Anton Lukoszevieze (cello), Hild Sofie Tafjord (French horn), Uli Philipp (bass), Hilary Jeffery (trombone), Maurice De Martin (drums), Burkhard Schlothauer (violin), Martin Wurmnest (sound) and Andreas Harder (light). 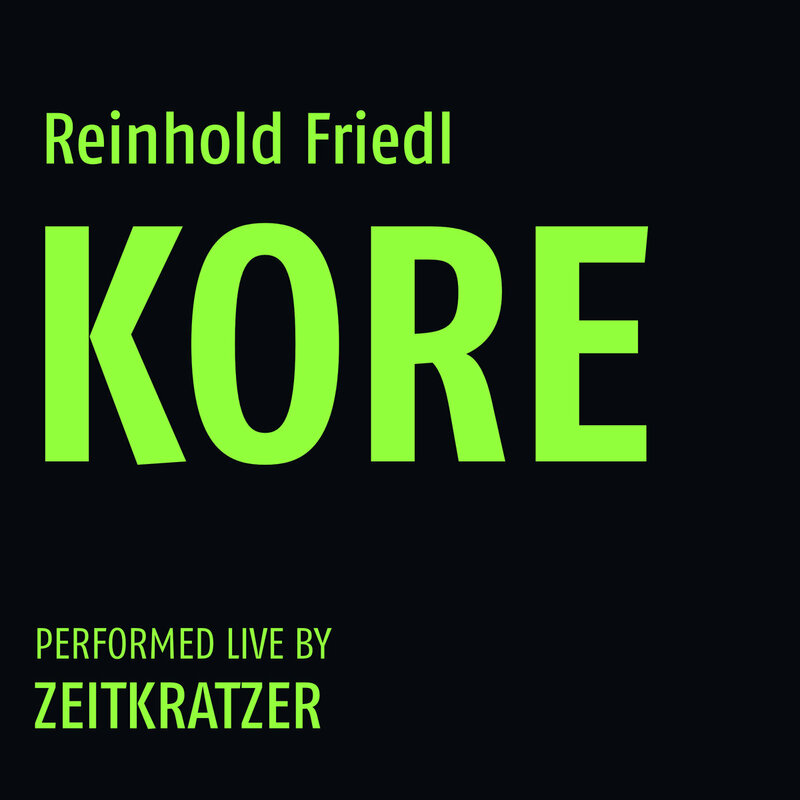 KORE is Reinhold Friedl’s continuation of his composition “Xenakis [a]live!” - a homage to the French-Greek composer Iannis Xenakis. Friedl refers to Xenakis’ tape compositions like Persepolis or La Legende d’Eer, in which Xenakis integrated his stochastic synthesis sounds, something made obvious in the materials, textures and densities, an approach which served as a model for zeitkratzer’s music. Persepolis is one of Xenakis’ so-called polytopes, which are closely tied to a specific architecture or to an archeological site. At these venues Xenakis used coordinates composed by points of sound (speakers). Starting from these presuppositions, he builds figures or volumes with music and light. For La légende d’Eer, another polytope, Xenakis used sound materials from three sources: instrumental sounds, noises, and electronically generated sounds, again he combines various selections of sounds in order to create a dynamic sonic landscape. The piece opens with static crescendo and juxtaposes percussion speckles against extended durations of sound particles. 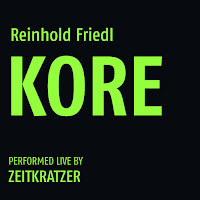 Friedl’s KORE is conceived for nine amplified instruments (Uli Philipp is replaced by Martin Heinze on the bass), again highlighting zeitkratzer's philosophy of amplification. It’s important for this philosophy that playing amplified does not only mean turning up the volume, the crucial point is to have a more accurate and detailed view on sound in general so that acoustic microsounds become more prominent. Like many Friedl compositions KORE is a precisely notated piece but it also has the energy of collectively improvised music, it brings together noise art and European improvised and experimental music.The basis for “Kore 1” is a massive bass drone pushed by metallic scrapes, gargling reeds and repetitive string glissandi and tremolos reminiscent of a shower of meteorites. You feel as if you were on a gigantic, horrifying merry-go-round from which you can’t dismount. “Kore 2” reduces the tension at the beginning by omitting the bass drone, just to bring it back after a few minutes, which increases the horrifying effect. A prepared piano hides in the background, the whole piece wheezes, snorts and growls. The creepy trombone and French horn finish you off. Then, in “Kore 3“, expansive percussion dominates the track, for example gongs set in front of squeaking strings and a crazily meandering piano, while “Part 4” collects the different voices to create a surging sonic hailstorm. When it’s over, all that’s left is exhaustion. But make no mistake: This isn’t a mere mishmash of sounds, every instrument is discernible, this music is subtle and finely crafted and in the end you can see the beauty in it. KORE is available on vinyl, as a CD and as a download.